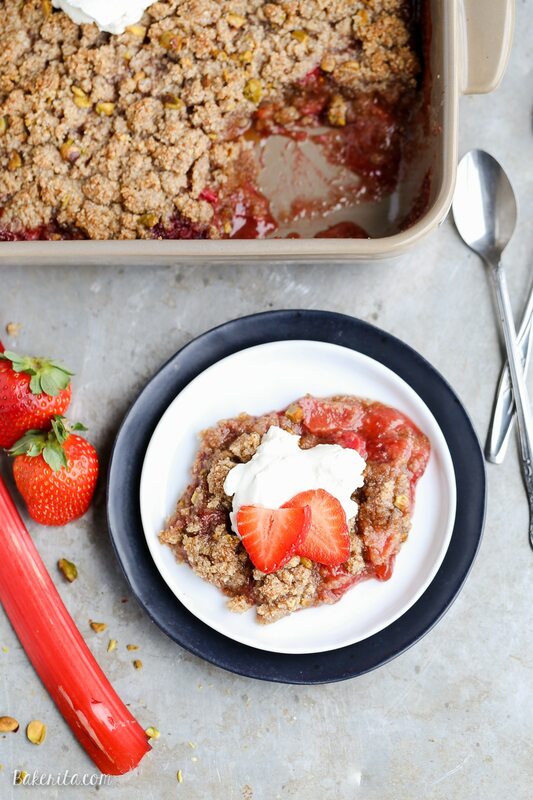 This Strawberry Rhubarb Crisp combines tart rhubarb and sweet strawberries, topped with a pistachio crumble topping! This crisp is Paleo-friendly, gluten-free, and vegan. Spring is almost here! You can feel it in the air, and I’ve been treasuring the extra hours of sunlight after a very long and dark Seattle winter. There’s been more sunny days scattered between the rain, flowers are starting to peek out from the ground, and hopefully the sad, bare trees will start turning green again any day now. But what’s really making me jump up and down for spring is the return of fresh fruits and veggies! 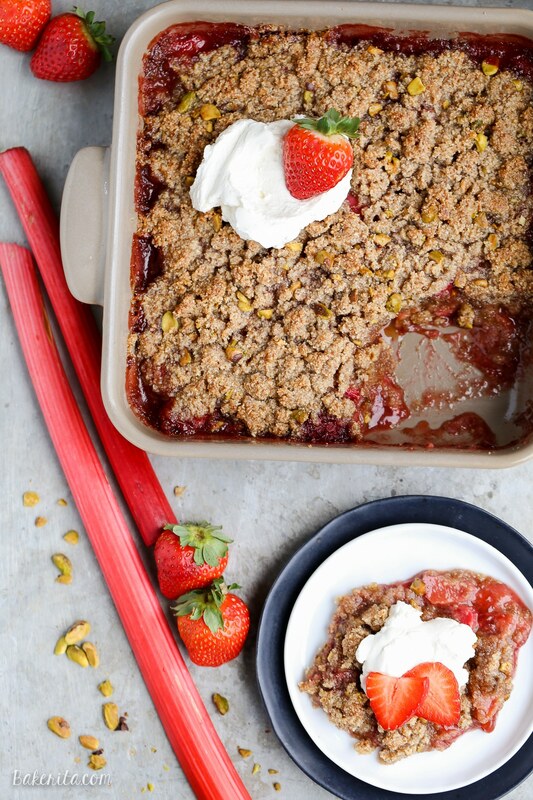 When I spotted rhubarb at the grocery store a few weeks ago, I jumped on it, and immediately started thinking of all the rhubarb desserts I could make this spring. My love for rhubarb is relatively new. I hadn’t really used the veggie much until last year, but after making this Berry Rhubarb Pie and Caramel Rhubarb Cake, I fell in love with the tart flavor to brings to any treat it’s added to. I’ve been anxiously awaiting it’s arrival this season, and my first rhubarb dessert doesn’t disappoint! Strawberries and rhubarb are a classic combination, and for good reason: the sweetness of the strawberries pairs so deliciously with the tart rhubarb. For this crisp filling, strawberries and rhubarb are tossed with maple syrup for sweetness, a little bit of lemon to brighten the flavors, and tapioca flour to help thicken things up a little bit. A crumble topping is piled on top of the fruit, and it’s all baked until bubbling. The topping is made with almond and coconut flours and sweetened with both coconut sugar and maple syrup. I added pistachios for crunch and color, but you can substitute any nut you’d like or have on hand. 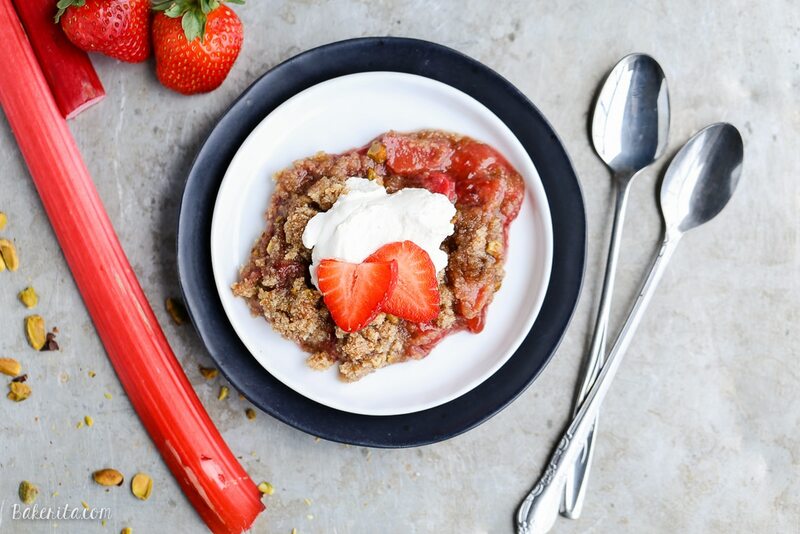 This strawberry rhubarb crisp is a pretty guilt-free dessert – it’s gluten-free, vegan, and Paleo-friendly! In fact, you could totally have this crisp for breakfast with zero guilt. Topped with some coconut cream or a bit of yogurt and you’ll be in healthy breakfast heaven! Make sure you find some rhubarb while it’s around, and while you’re at it, stock some up in the freezer so you can have rhubarb treats all year round! What fruits and veggies are you looking forward to this Spring? Preheat oven to 350°F. Lightly grease an 8x8” pan or 10” cast iron skillet with coconut oil. Set aside. In a large bowl, combine the rhubarb, strawberries, lemon zest, lemon juice, maple syrup, salt, and tapioca flour. Stir to combine. Pour into the prepared pan. In large bowl, combine the almond flour, salt, cinnamon, and coconut sugar. Whisk to combine. Add the coconut oil and using a pastry cutter or two forks, work the coconut oil into the dry ingredients until the coconut oil is in little bits. Add the maple syrup and toss to combine until the mixture sticks together. Stir in pistachios. Top the fruit with the crumble mixture. Bake for 25-30 minutes or until bubbling and the top is lightly browned. Serve with coconut whipped cream! I’m so excited for spring and all of the fresh fruit that’s on its way! This crisp looks perfect, Rachel! Wish I could dig in for breakfast! Strawberry rhubarb is one of my favorite combinations! This crisp would disappear in a hurry at our house! Can you believe I’ve never had rhubarb? Honestly, it scares me. I’m going to have to muster up the courage to give a try in this crisp, which looks delicous! I just saw that daylight savings is next Sunday! We’ll be having tons more daylight. Woo hoo! And this strawberry rhubarb crisp is perfection. Love how healthy it is! Dairy free, so I can definitely eat it! I’m looking forward to Spring. Can you believe I’ve never had rhubarb until I moved to the US a year ago? I’m madly in love with it. I’ve only had it in pies though. Is rhubarb only good in desserts? I’ve only ever had rhubarb in desserts, but it is technically a vegetable! Though I don’t think using it for savory purposes is as common as in desserts, you can use rhubarb in savory applications. I only recently discovered it too, but it’s SO good! Thanks for the comment, Christine! Could I change the almond and coconut flour? And also leave out the coconut sugar? I can’t have theses ingredients as I’m allergic! Hi Rachel. You could substitute the almond and coconut flour with another nut flour, or maybe a gluten-free flour blend – I haven’t tried it though, so I can’t make any guarantees. You could skip the coconut sugar but you may want to add a bit of extra maple syrup to compensate for the missing sweetness. This is making me SO in the mood for spring. This would be great for Easter! Oh man! My rhubarb won’t be up in my garden until May, and now I’m feeling impatient! Strawberry& Rhubarb together is my favourite!! This looks SO tasty! strawberry rhubarb is my favorite summer dessert combo ever! And this is paleo? Cant wait to make it! I would make mango black bean salsa if I had these knives! Lots of chopping with a great knife is a state of Zen for me. I tried it. I am glad I am not allergic to gluten, however I try to eat healthy. It is not the greatest. The problem is that It is to sweet, even if it is suppose to be healthy for you, maple sugar is still sugar. I didn’t put the maple sirup in the batter. The coconut sugar was plenty. Sugar is the enemy, maybe more than gluten. Hi, thank you for this recipe. Made this today with rhubarb and a mixture of berries. Was absolutely delicious! Knew it was going to be yummy when I looked at the ingredients. One thing to add is when using coconut oil in baked goods like this, better to use refined coconut oil, as unrefined oil has a powerful coconut flavor which can overtake the other flavors. Delicious nonetheless! Thanks for sharing this recipe! Can’t wait to give it a go! I hope you love it, Jenn! I love strawberries, so this one is perfect for me. I think it is great combined with rhubarb. I will definitely try this recipe. Thanks for sharing! You can never go wrong with strawberry. This recipe looks so healthy and delicious. I’m definitely giving it a try at home. It’s the perfect dessert especially for health conscious people. Strawberries tastes great on many things. This one surely is a winner. My family will love this. Hope you and your family love it! Such an appetizing post! The photos make me feel hungry. 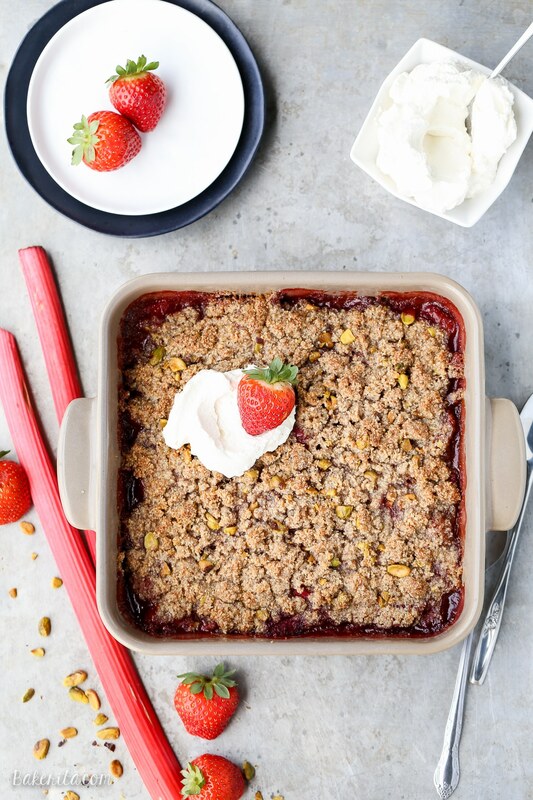 Thanks for sharing your recipe for Strawberry Rhubarb Crisp. I love that it is gluten-free, vegan, and Paleo-friendly. I can’t wait to try this at home. Thanks for the love, Aika!